Johnstown Tomahawks have gone 8 for 24 on the power play this season vs the Jamestown Ironmen, on Friday night went 0 for 4, but a great team effort still provided them with a 3-1 win. 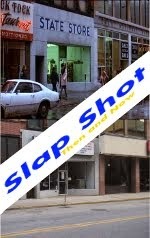 Johnstown scored the only goal of the first period off a faceoff, just outside the Jamestown's blue line. Jeff Bergh shot the puck onto the net and it somehow found it's way past netminder, Joe Ballmer. The assist on the play went to Mitch Kontny. The score would remain that way until the third period. A nice wrist shoot, from the blue line, by Ian Spencer gave the Tomahawks a two goal lead. The assists went to Zach Wallace and JB Baker. In the last few minutes of the game, Jamestown pulled the goalie to give them the extra attacker. At 18:33, Jamestown was able to solve Chris Truehl and put one past the goaltender, pulling them within one goal. It was scored by Ryan Doucet assist going to Evan Ritt. Once again, Jamestown, pulled the goalie and put good pressure on Johnstown to try and tie the game up before the final buzzer. On his third attempt to score on the empty net, Jordan Watt was able to get a clear shot, to put the game out of reach. Johnstown is now 4-1-0 this season vs Jamestown with three remaining games vs the Ironmen this season, the next, of course, coming tonight at the CCWM. 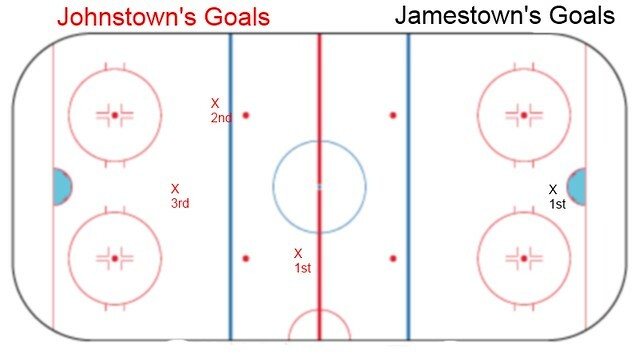 Jamestown also was not able to score on the power play going 0 for 3. The game had a playoff atmosphere and included several mini scrums and two fights. The first fight came in the first period away from the play, when Jake Fairchild dropped the gloves with Joe Mottiqua. The second fight occurred late in the first period when Brandon Reinholz, who already was getting a two minute penalty for slashing, met up with Tyler Minx for the second scrap of the game. Johnstown out shot Jamestown 27-26. Chris Truehl picked up the win, making 25 saves on 26 shots. He improves his record to 14-9-6, with a GAA of 2.47 and a save percentage of .919. Joe Ballmer got the loss for Jamestown, making 25 saves on 27 shots. His record drops to 5-2-0, with a GAA of 2.53 and a save percentage of .921. 3- Jordan Watt- Johnstown- Had the empty net goal to give Johnstown a two goal lead. He also finished the game with a +2 and five shots on net. Watt is on a three game point streak. 2- Ian Spencer- Johnstown- Scored the game winning goal on his only shot of the game. He also finished with a +2 rating. 1- Chris Truehl- Made 25 saves on 26 shots, including a couple amazing saves that had the fan's wondering "how did that not go in". Last game of the regular season at home tonight. Let's go 'Hawks!